What is the turnover rate for EMTs, paramedics? EMS has an employee turnover rate higher than other occupations, according to a recently completed study and report by the American Ambulance Association. 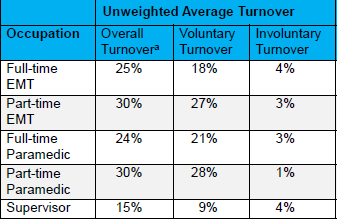 The employment sector – private versus public – is the top predictor of voluntary turnover. To better understand turnover in the EMS industry, the AAA partnered with Avesta to conduct a survey, managed by the Center for Organizational Research at the University of Akron. This study – the first one of its size and comprehensive scope – sought to quantify and understand the turnover rate in different EMS occupations, including part-time and full-time paramedics and EMTs. The report and webinar, available to AAA members, has set an important benchmark for turnover and is a crucial first step to reducing EMS employee turnover. Dennis Doverspike, Ph.D., the primary investigator and a psychology professor, presented the study results and was joined by Scott Moore, Esq., an EMS human resources and operations consultant; and Greg Lawton, president of Avesta. Doverspike collected data using a survey of EMS organizations in the spring of 2018. Seven-hundred organizations were invited to participate, and 119 organizations submitted responses. Most organizations who responded had less than 100 employees. About one-third of responses came from private, for-profit organizations, just under one-third came from private, not-for-profit organizations, and a final one-third of responses were received from public-sector stand-alone organizations. No responses were received from public-sector fire departments and the balance of responses came from hospital-based EMS organizations. Data was collected at the organization level, not at the individual level. Thus, the study doesn’t report the aggregated reasons individuals chose to leave. A representative for each organization cited the top reasons for voluntary or involuntary separation. Separations: the total number of people in each job classification who left the organization at any time in 2017. Head count: the total number of filled positions plus the number of open positions at the end of 2017. Turnover rate: the rate for each job classification is determined by dividing separations by headcount. Turnover was described as overall turnover, voluntary turnover and involuntary turnover. A 25-percent turnover rate means 100 percent turnover in an organization’s staffing every four years. Organizations should expect a certain percentage of turnover because of unpredictable life circumstances (e.g., a spouse’s job is relocated to a different state). Organization representatives cited career change and pay dissatisfaction as the top reasons for voluntary turnover. Poor performance is the top cause of involuntary turnover. The EMS industry turnover rate, according to Doverspike, compares favorably with the Bureau of Labor Statistics data for all occupations, but generally is high compared to research conducted by the Society for Human Resource Management. Healthcare occupation rates are higher than all U.S. occupation. The research team attempted to identify predictors of turnover. The best predictor, based on data analysis, is sector. Working in the private sector is predictive of higher voluntary turnover. Geography and organization size were not predictive. Turnover is a major healthcare challenge that is poorly understood because there is a lack of good data and benchmarks. With U.S. unemployment levels at their lowest rates in years, the job market is extremely competitive. Across all occupations, more people indicate they are looking for a new job or wanting to leave their job than at any time since 2001. Doverspike expects the problem of EMS turnover and retention to worsen. Here are my four top takeaways on the EMS industry turnover. The findings of the study are unlikely to be surprising to EMS leaders, managers and field providers, but it’s critical to have benchmark data. Now methods implemented to lower turnover and improve retention can be measured to assess their impact on the organization. Frequent, regular and respectful communication with personnel. Ensuring field providers perceive assignments, discipline is fair. Following organization policies and procedures for performance management. Assisting their team in maintaining a healthy work-life balance. It’s important to regularly ask personnel who stay on the job why they are staying. Determining the attributes of the occupation that improve retention is just as important, if not more important, than asking people why they leave. Doverspike encouraged the audience to analyze the results for any differences between experienced and inexperienced EMS providers. Introducing programs to allow for career growth. Improving work schedules for better work-life balance. Involving employees in process, policy and protocol changes. Improving health, wellness, and workplace safety programs to reduce injuries and enhance physical, mental and emotional health. The American Ambulance Association is planning an annual study of EMS turnover rates. The data collected will be used to develop education programs for leaders and innovate methods for EMS provider recruitment, selection, hiring and turnover. Further study is also needed to calculate the cost of turnover and to better understand the causes of turnover. Researchers also want to learn from EMS organizations that have high rates of retention. Are we working EMS providers to death?